If you are looking for the best tasting onion chutney that has only four ingredients and takes 5 minutes to cook, you have come to the right place. This delicious cumin laden chutney lifts pappadums and indian pastries into something wonderfully memorable. This recipe is designed to be super fast and super easy to make for busy people on the run who still want a restaurant style dish and great flavour with little effort. Be warned that is is very moreish – so don’t blame me if you end up eating the whole bowl of chutney in one go. The cumin, onion and butter are a perfect match on a tomato base. 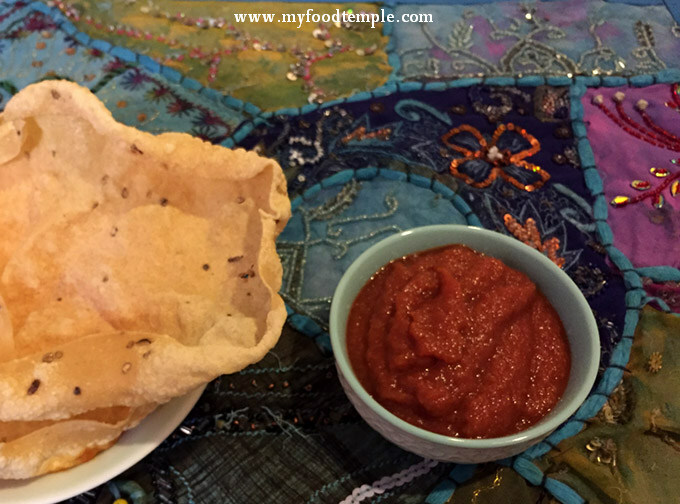 Pappadums are one of those things everyone should have in their pantry, as with the right chutney, they can transform a home cooked Indian meal. They also make a great snack or can replace dips and chips as a more interesting tasty option. Just thinking about this chutney is making me hungry. If you make this, I would love to hear what you think!